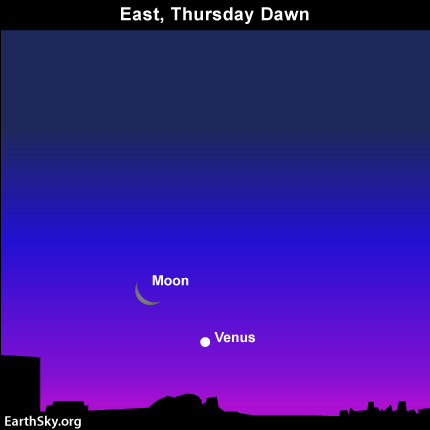 Did you see the waning crescent moon and the blazing planet Venus today (Wednesday, March 30, 2011), before sunrise? At morning dawn tomorrow (Thursday, March 31) a thinner lunar crescent will pair up with Venus, which is sometimes called the “morning star.” As seen from the northern hemisphere, the moon and Venus will sit low in the east at dawn. Therefore, you will need an unobstructed view eastward to see them. The moon and Venus, though close together on the sky’s dome, are nowhere near each other in space. The moon, our closest celestial neighbor, lies nearly 252,000 miles away, while Venus lodges at over 460 times the moon’s distance from us. Looking at it in another way, sunlight reflected from the moon takes about 1.35 seconds to reach Earth, but sunlight reflected from Venus takes about 10.5 minutes to reach us. The moon and Venus shine by reflecting sunlight, just as Earth does. In other words, the moon and Venus – like Earth – have a day side and a night side. However, the moon and Venus rotate more slowly on their axes than we do, so a day lasts longer on these two worlds than it does on Earth. On Earth, a day is 24 hours long. On the moon, one day equals a month, with two weeks of daylight followed by two weeks of night. In addition, on Venus, one day lasts for 117 Earth-days. Tomorrow – March 31, 2011 – at early dawn, watch as these two beauties – the moon and Venus – bask in the light of the sun!